Samsung Galaxy A7 2017 is still very new in the market and in fact, some regions are just receiving the phone in their local stores. Even though the handset, alongside the Galaxy A3 2017 and Galaxy A5 2017, came in this year, one disappointing feature was that it came with Android 6.0 Marshmallow running the show. Despite featuring one of the best designs, features as well as specs you can find in a midrange phone, the idea of running on old software was obviously going to be a deal breaker. In order to make amends for this, Samsung appears to be readying the Galaxy A7 2017 for the Nougat update. The phone has appeared on benchmarking website GFXBench and so far, Android 7.0 Nougat is at the heart of the software show. The phone listed has model number SM-A720X, which all but confirms the identity of the A7 2017. 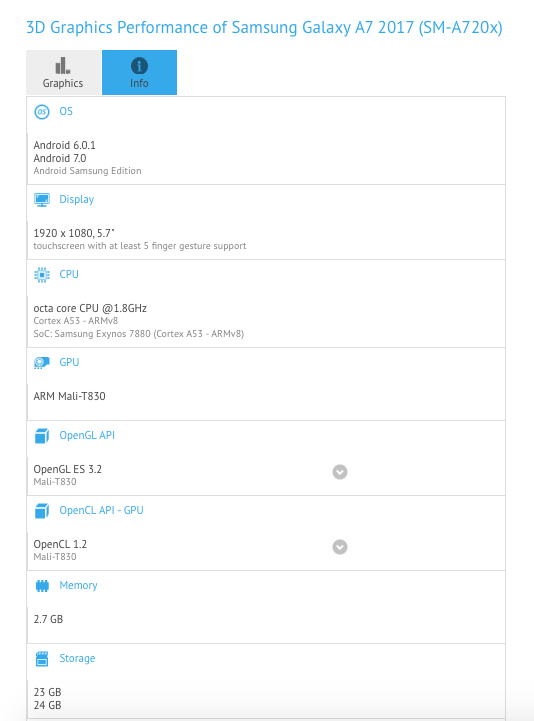 In addition, the listing also confirms a good number of the specs that we see on the Galaxy A7 2017. These include a Super AMOLED screen with 5.7 inches of display and a resolution of 1080p, an Exynos 7880 octa-core processor clocked at 1.8GHz, a 3GB RAM and 32GB of storage, which can be expanded using a microSD card of up to 256GB. The back of the Galaxy A7 2017 has a 16MP camera and so does the front. However, the former has more features as opposed to the latter. The major highlight of the Galaxy A 2017 series, which includes the aforementioned A3 2017 and A5 2017 models, is that you’ll be protected from water and dust thanks to the IP68 certified body used for the design. Now that Android 7.0 Nougat is coming to the Galaxy A7 2017 – and hopefully the other Galaxy A 2017 handsets – it will get even better for this phone, but for now, we still don’t know the exact date that this will be happening. Previous reports had suggested that the update could be available starting this Q2 2017, but the exact dates were not mentioned. Of course, we’ll follow the matter and keep you up to date with the latest happenings. Stay tuned!